The Tronsmart Presto PBT10 is a small battery that packs a punch. 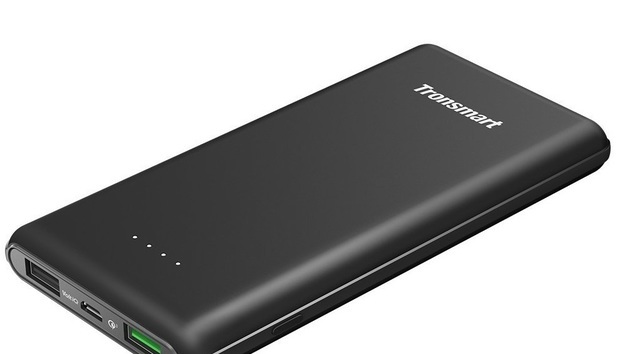 At 10,000mAh (37Wh), it’s not made to last you an entire weekend off the grid. It will, however, keep your device charged as you run through the airport or catch a train. It’s small enough to fit into a coat pocket or the side pocket on a backpack without issue. On the front of the pack are three ports: two USB-A, one Micro-USB. The bigger ports, one of which is green to indicate QC3.0 compatibility, are for charging your phone or tablet. The Micro-USB port is for charging the battery itself. The PBT10’s smooth finish isn’t slippery like with other plastic housings, so you shouldn’t have issues with it sliding out of your hand or pocket. On top of the pack are four indicator lights, as well as a power button. The only complaint I have about the pack is that the USB port housings aren’t exactly lined up with the opening on the battery pack’s outer housing. It doesn’t prevent anything from being plugged into the battery, it just looks bad. As far as efficiency goes, the PBT10 scored 90.48 percent and takes just four hours to recharge. Included in the box are the pack itself, a small carrying bag, and a Micro-USB cable. After plugging a Samsung Note 8 into the PBT10, it instantly displayed that it was fast charging, as expected. Bottom line: Of all the battery packs we tested, this is by far the best option for a traveling battery pack. It’s also QC 3.0 compatible and incredibly efficient.